To kick start the series of Design Patterns in Apex I’m going to cover the Strategy Pattern, as it is one of the most common patterns – and one that can be applied well in Apex/Salesforce. 1. What does it do? 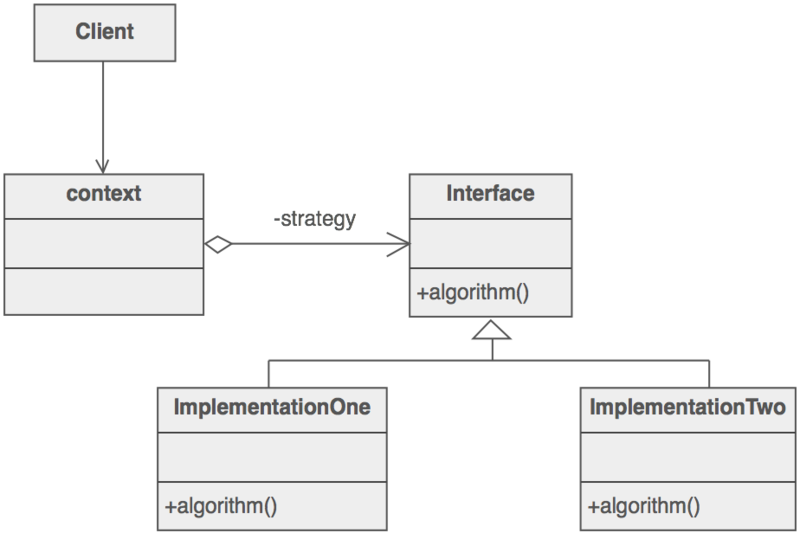 The strategy pattern allows an algorithm’s behaviour to be chosen at runtime. It can be used to define a family of algorithms that solve a common goal. It permits unique logic per algorithm via encapsulation, but ensures that all algorithms are interchangeable at runtime. The abstraction is captured by an interface, whilst individual implementations are buried in derived classes. 2. When should it be used? The strategy pattern should be used when you wish to perform an operation that has a common end-goal, but has several different approaches to get there – which can be chosen by the client at runtime. You wish to retrieve the local weather for an Account based on its location, but need to use several different Weather APIs to get the best results – based on the country which the Account is located in. You have a complex algorithm to calculate expected revenue on Opportunities, and this algorithm gets refined each month. Each month should still be calculated with its respective algorithm You wish to build something that is both expandable, and allows you to retrospectively perform calculations. 3. How do I use it? The strategy pattern has several components. Interface Class – An interface, which is the strategy itself. It defines a set of methods that will be implemented by the concrete strategy classes. Concrete Strategies – A group of classes that implement the methods defined by the strategy interface. They encapsulate any logic that is unique to that particular concrete strategy. Design a solution to retrieve the current weather for an Account in Salesforce. There are several freely available Weather APIs, however, some perform better than others in certain continents. The code must be expandable for future Weather APIs. First define an interface, which lists the common methods which the concrete strategy classes will implement. An interface is an abstract type that is used to specify a list of methods which its non-abstract classes must implement. It adds a layer of formalisation to polymorphism – it enforces that all implementations of a class have a set of predefined behaviours. It can be considered a promise. A promise that all classes which implement it will always contain the methods defined in the interface. getTemperatureInCelsius() – which takes the JSON response as an argument and will parse out the current temperature, and return it in celsius. Next, the interface must be implemented by the concrete classes, which are deemed as the individual strategies. In this example, there are two implementations – one which uses Forcast.io and another which uses OpenWeatherMap. Each implementation shares a set of common methods, as defined by the interface, however, it can be seen that the implementations differ. For example, one API returns the temperature in Fahrenheit, whilst the other returns the temperature in Kelvin. The getTemperatureInCelsius() method implies that the temperature should be returned in Celsius, so each implementation performs the necessary conversion. Next, the context class. This class contains the logic which defines which strategy is used at runtime. As the strategies both implement the abstract-type interface, we can use polymorphism to bind the chosen strategy to an instance variable that has the type of the interface – in this case it’s a variable called weatherServiceType which has a type of WeatherService. As this is a simple example, the logic to choose which strategy is defined in a constructor for the class which takes a continent(string) argument. If the logic was more complex, it could be offloaded to another method which takes more arguments. The context class also has methods which call the appropriate concrete strategy methods. Even though behind the scenes, each example is using an entirely different weather API, this complexity is hidden from the client. One area which I wish to cover on this blog is using design patterns in Salesforce. Although the common patterns are thoroughly documented on the internet, there are very few articles that are specific to Salesforce – and whilst the patterns are generally language/platform agnostic, one of the most important steps in using a pattern is decided when to use it. Hopefully some of the suggestions and examples in upcoming posts will cover this. This guy is a very gifted teacher, his videos are absolutely invaluable. He covers most of the design patterns, as well as a whole host of other topics. Don’t judge a book by its cover! This book is fantastic at explaining the patterns in a (cheesy) but accessible way. I actually own it both on Kindle and paperback – I would definitely recommend the latter as it is code/image/diagram heavy. The ‘bible’ of design patterns – no list would be complete without it. Good for reference, but a fairly dense read – I think the former two resources are much more accessible.